This year we're excited to announce that Christmas Jumper Day is layering up! We've teamed up with ITV Text Santa and two other fantastic charities. Text Santa Christmas Jumper Day will take place on Friday 18 December. Wear a Christmas Jumper to school on Friday 18th December and donate £1. The money you raise will help Macmillan Cancer Support, Make-A-Wish® UK and Save the Children, giving hope to families in difficulty at Christmas. 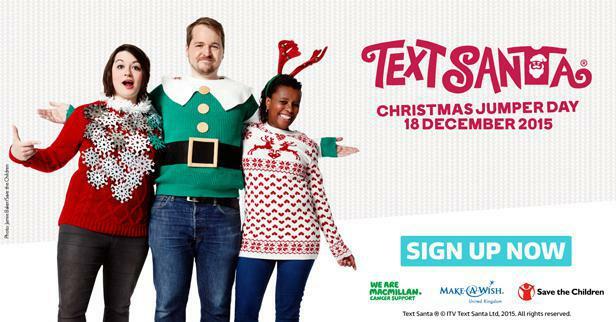 And don't forget to tune into ITV on 18 December for the Text Santa Christmas Jumper Day show! Thank you for doing your bit in a Christmas knit.